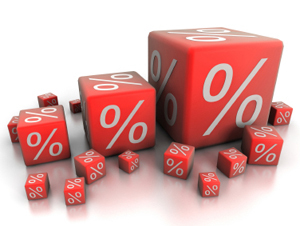 Different mortgage products will have differing interest rates associated with them. When choosing a mortgage, it’s really the APR that is important. This is the Annual Percentage Rate and is the annual rate of interest including all other charges, the term of the loan and the interest rate. Your lender might also talk about the CPT or the Cost per Thousand. This is the cost … of your mortgage for every 100,000 euro borrowed. The main rates available are flexible or variable (includes tracker), fixed or split. At the moment, the variable or tracker rates are the most popular as interest rates are at an all time low. If you can get a fixed rate mortgage at the current rates, you’ll be laughing all the way to the bank. With a variable rate, your lender may pass on cuts in interest rates made by the European Central Bank. A tracker rate is directly tied in with the ECB rate so if the ECB makes a cut in interest rates, then this will be directly reflected in your mortgage repayments. With a fixed rate, you are tied to that rate for an agreed period, while a split rate is a mortgage that is a mixture of both a fixed and a variable. Try to lock in a fixed rate mortgage at current rates! Obviously it would be best to have a variable mortgage right now. However, if you choose a variable mortgage now is it easy to fix the rate at any point in the future or do you need to agree to a variable rate for a specific period. I am a first-time buyer so it’s all new to me?????? ?